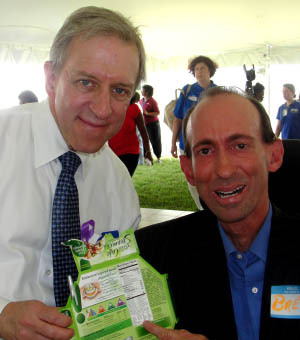  Laughing Matters with Brett Leake is picked up by American Public Television marking its eighth consecutive year of distribution to the nations public broadcasting stations. - Herndon High School in Fairfax County, Va. 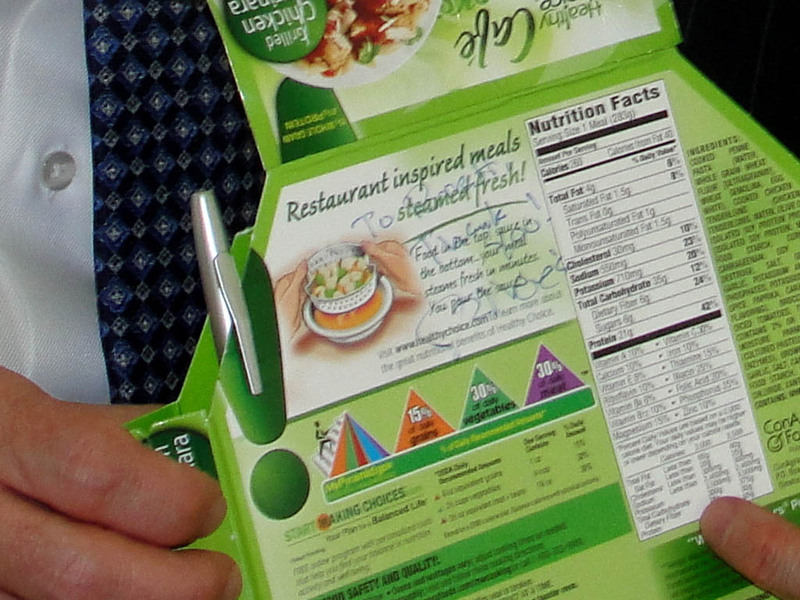 The Green Blob and the Red Rock: When humus is human and DNA is PzZgs. Hugh Hammond Bennett (Natural Resources Conservation Service Website) whose writings and speeches on soil science by 1935 led to the creation of the Soil Conservation Service did much of his ground breaking work in 1905 when he was breaking ground in the ultisols of western Louisa County, Virginia. I was unaware of the local connection until I learned more about him and his work from David Faulker, natural resource economist with Natural Resources Conservation Service in Richmond. I found Bennett’s time in Louisa fascinating geologically and genealogically. I search for places where geology is expressed topographically, where the lay of the land depicts what lay beneath the land, and the work he did – the dirt he dug – is in a region where the geology is expressed vegetationally. Also, I have come to learn recently a bit more about my paternal grandfather’s family. He and his 13 siblings lived in western Louisa at the time. It’s possible that as my grandfather, ten years old then, turned over stones in Mechunk Creek looking for crayfish Bennett lifted them, too, to sample the soil beneath them. Rocks don’t stick out of the ground nearly as much as I’d like here in the piedmont, a word grounded in ‘nearly flat’. The Triassic basins are comparatively low with basalt and diabase highs but the basins make up only about 10-15 percent of the piedmont. The rest of the piedmont is a maturely dissected upland, a rolling plain. I want relief. But just north of Zion Crossroads as one heads towards Gordonsville on US 15 the oak-hickory forest opens wide to panoramic fields and it’s geology setting the stage if not vertically then horizontally. 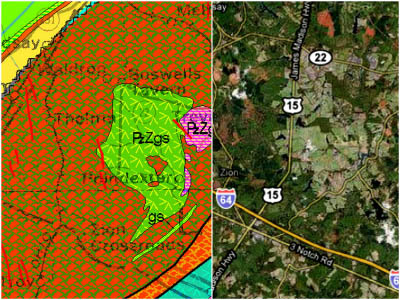 Side by side, the Virginia Geology Map (1993) and a Google aerial map, depict the scene below and above the surface. PzZgs is the Green Springs pluton, the geology map’s roundish green blob of ultramafic rock set within the mélange of the Taconic continent to volcanic arc collision that occurred 450 million years ago. You can see where we’re going with this — the green blob in the geology map aligns with the fields in the Google map; the red rock with the woods. The rock of the pluton produces a soil that historically has borne a competitive advantage to those who farmed. The mélange rocks (red in the geologic map) weather into a soil that leads to, at best, marginally productive croplands. Over the years, many of the families on the red rock who tried farming gave it up and left for the city and behind them abandoned fields that have since reverted to the dark green woods and that slowly mature or are timbered today. Bennett in 1905 had been sent to western Louisa County to do a soil survey instructed “to look carefully into the reason behind the reputation of the region for the poverty of its farmland.” He worked primarily in the red rock where farmers trying to eke out a living felt forced to plant on steep slopes or planted too frequently on the infrequent ‘flats’. Such practices not only left soil malnourished but exposed it to the local humid climate after which it soon washed down the hill. 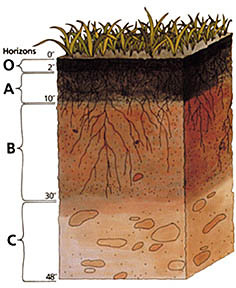 The O and A soil horizons, the top two layers of soil, that Bennett found not on the flats but washed down into the creek lead to the discovery of ‘sheet erosion’. His calls in the 1920s and early 30s for changes in farming techniques that would leave these top layers in place drew growing attention but not enough for the Dust Bowl, an event he anticipated, to be averted. The ‘reason behind the reputation’ was not solely a local phenomena regarding rock type in Louisa County but the nation’s disposition toward the soil – treating it like dirt – and man’s unhealthy interaction with the land. The neighboring green blob, the Green Springs pluton, is not productive soil today solely because of Bennett’s work – rock type has played a significant role. The pluton’s pH is more basic than the red rock’s and requires less fertilizer. The pluton’s rock being homogenous has eroded evenly – its slopes are relatively gentle leaving the soil less prone to creep. Man has had more room for error here than on the ‘talcose schist’ (Bennett’s term for the red rock; Czpm – metagraywacke and quartzose schist) where the rock types within it wore unevenly and where the same primitive plowing and crop rotation left the land broken. Man and the natural world can coexist. Today, the pluton’s landscape receives a level of protection as the Green Springs National Historic Landmark District in recognition of a place where the “the landscape has been enhanced, rather than despoiled, by the presence of civilization.” It is fitting a degree of harmony exists so near Bennett’s early investigations. The District serves also as an example of what the future might hold in spite of daunting prospects. By 2007, for the first time in human history, more of the global population lived in cities than in rural areas. When Bennett worked in Louisa, the number of US residents numbered 84 million, and the world population was 1.6 billion. Today, there are over 310 million US residents and the world population is projected to soon reach 7 billion. As man becomes less attached to the same rural areas that will be called on to produce more foodstuffs, more recreation, more biodiversity the challenge is formidable to remain much less become stewards of the land. A human perspective that looks down on its natural family sets in motion a feedback loop that hits close to this home – my father’s father and his people are red rock people; they grew up in Thelma to the west (left) of the pluton. Where the residents of the Green Spring’s district raised enough crops for a surplus to sell to others, built the 200 year old homes that line US 15 and stayed together as families, my grandfather and his kin getting little to grow in the B layer, the clay subsoil, that remained after sheet erosion, moved away to make a living, saw families split, and each to his own roamed. I come across ovenbirds learning to fly. A parent catches a morsel as a breeze sways the large leaves of a young mockernut hickory. Morsel unidentified. In 2011, Virginia honored Hugh Hammond Bennett, considered ‘the Father of Soil Conservation’, by erecting a roadside marker in front of the Louisa County Historical Society’s Sargeant museum. May farmers of Green Springs-like districts wherever they may be found guide by Bennett and his followers, the Natural Resources Conservation agents who ‘help people help the land’ and may the lessons learned on the red rock continue to deepen our appreciation for the soil at our feet and for the families it has helped condition and sustain including those of the spring peepers, pignut hickories, black and white warblers, and ethereal thrush that also call this dirt its home.